After I put my new profile picture up last week, I got a few emails asking me about my wooden beads. They're by Kayce Hughes, one of our super-talented sponsors, and are my absolute favorite. I wear them all of the time and they always get compliments. I wanted to let you know that Kayce's having giving away the beads on her blog!! Click here to enter. If you don't know Kayce yet, make sure to read through her beautiful blog... She's a successful fashion designer, mother to 7 beautiful kids and has a seriously stylish home... You'll love her. Thanks for the link to the giveaway. I'm heading over there right now. Those beads are seriously beautiful. I have a yellow amber necklace that my mother-in-law gifted me that she in turn received from her MIL years ago. It is very similar to these lovely beads and a favorite of mine. Oooooh. 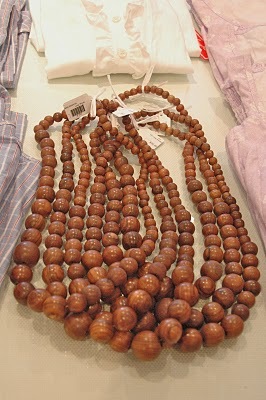 Lovin' those clunky wooden beads! Need me some for sure! I think those beads are such a wonderful color, look great on grey or black. Just my color. I went to the dress site, very nice. These are awesome and you look fabulous in them! Love the beads and I'm wondering where she finds the time to do so much with seven kids? Truly a super Mom. Can we please have a post on where all this super Moms find the time! I have one daughter(a fire cracker, but one nevertheless) and can't barely find the time to take a shower let alone get my business off the ground! You gals are amazing! Thanks for sharing this post, I'm heading over there!